A persistent feature of the 2016 Presidential election campaign has been Donald Trump’s steady stream of promises to “make America great again”. The constant repetition of that mantra has motivated me to look back to the time when America was great – and to take another look at how our President was motivating everyone in this country to make such significant strides. Although television has provided us with constant reminders of President Kennedy’s great oratory skills, that medium has offered us little of what his predecessor, President Dwight Eisenhower offered by way of motivational elocution. After all, the years of the Eisenhower Presidency (1953 – 1961) marked the era when America’s middle class strengthened to the level where young families were buying newly-constructed, air-conditioned homes – as well as shiny, new cars – on a grand scale. When you ask most people to recall a quote made by President Eisenhower, the usual response is a reference to his warning about the unrestrained power of the military-industrial complex. 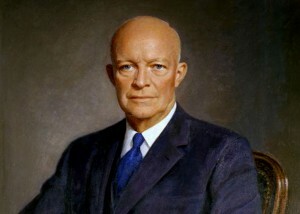 Those remarks were included in Ike’s farewell address, which he presented on television, when he left office on January 17, 1961 – three days before his term expired. I suggest watching the entire speech. It lasts only fifteen minutes and it has remained every bit as relevant today as it was in 1961.